I went to Helser’s once when I had been driving around Oregon for days, hosting a friend from Switzerland, staying in fancy hotels and eating rich food. I was ready to settle back into my Portland routine and calm down, eat something simple and tasty. Manuela was still looking for a place to eat breakfast in America where she could get only what she wanted – pancakes and fruit – and not leave a meal’s worth of feed behind. She said it made her feel guilty. So we walked into Helser’s, and I got a Yukon gold potato hash with some simple poached eggs: just lightly-seasoned potatoes with an edge of crispiness and the eggs just right. Perfect. Manuela asked about the pancakes, was told there were four to an order, asked if she could have only two, the waitress said absolutely, and she got a side of yogurt and fruit. Ate the whole thing. We spent $10 each. Perfect. Another time I went to Helser’s when I was heading out for a hike, and I wanted something filling. I was there before 9 and got the single portion of smoked salmon benedict, the fish moist and the sauce creamy. I paid $3.95 for it, walked out feeling just a little stuffed, and didn’t eat a thing during the walk. Perfect. Another time I just wanted to feed my sweet tooth, so I walked over and got the full portion of the brioche French toast, sliced thick and soaked in vanilla cinnamon batter. I walked out with a little buzz working. Perfect. Everybody I know likes Helser’s. And other than the usual internet wackos, everybody I’ve heard from likes Helser’s. It’s either the benedicts (they also come with Zenner’s ham or spinach, crimini mushrooms and tomatoes) or the French toast or the specials (one time it was maple breakfast bread pudding) or the warm pear and havarti pie in an egg custard with crème fraiche. Helser’s is one of four breakfast places in the Alberta neighborhood, and it’s right in the middle of them in every way. It’s not trying to save the world and help everyone eat better like the Vita Café – nor does it have the Vita’s occasional stoned-feeling service. It’s not trying to be young and hip and “Alberta Arts” like the Tin Shed, but it also doesn’t have the Shed’s outdoor seating. It’s less of a locals-only place than the Cup and Saucer, but it has more exciting food. And its wait on weekends is longer than Vita’s, shorter than the Shed’s. Helser’s just seems very simple, in a good way. It’s borderline Zen. Wood tables, comfortably spaced from one another. Wood chairs that are wide and comfortable. Tall ceilings. Plenty of windows and light. A few flowers on the table. Some bamboo. Beige walls. Servers wearing black and white. Simple light fixtures. Soft jazz playing. It’s local and it’s classy. I sit there on weekdays and watch moms with babies, people on their way to work, people actually working, hipsters being hip, folks on the street waving to folks at tables, the staff greeting regulars and still taking care of everyone else. I feel at home, and I feel impressed. As for the food, the complaints I’ve heard boil down to two things: they’re trying to do to much, or “I don’t like how they do their (fill in the blank).” Usually, the latter complaint is focused on the Scotch eggs (hard-boiled eggs wrapped in bratwurst, lightly breaded and fried) or the Louisiana Hot Sausage Scramble (two eggs, fried onions, spicy smoked sausage wrapped in tomato flour tortilla with cheddar cheese and scallions) or the Dutch Baby, which is not as fluffy or filling as at Zell’s or the Original Pancake House. Well, here’s another way of looking at it: How many places in town have a Dutch Baby, Scotch Eggs, and three kinds of sausage? Russet potato pancakes and Yukon gold hash? And mushroom hash? And pepper bacon hash? And three benedicts? 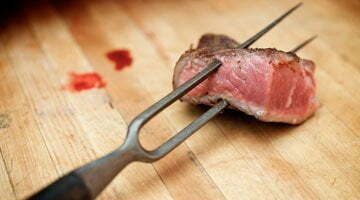 And tri tip steak and eggs? Absolutely, they are all over the map, and maybe they don’t have the best-in-town of anything, but their average is darn high in my book, and it’s been fun exploring the menu. And yes, I’m biased, because I live about five blocks away and have a crush on half the wait staff. Consider that your disclaimer. All I know is that every time I go to Helser’s I’m in the mood for something in particular, and they always have it. And if I get there before 9, I get it for $3.95, which might be the most sensible thing in town. Breakfast shouldn’t hurt! Breakfast should be relaxing and sweet, or filling and meaty, or fruity and warm, or friendly and local, or a destination and special. It should be what you want, when you want it. Helser’s has always been all of that. Portion Size: Average for Portland, but smaller and cheaper before 9 a.m.
Feel-goods: Pure maple syrup for $1.25 extra. Paul, I’m so glad you reviewed Helser’s. I confess, I’m not really a big fan of most breakfast foods, and absolutely hate waiting for eggs, but I too live close to Helser’s and love it. You nailed all the great things about Helser’s. I just love the $3.95 before 9:00AM breakfast specials. You leave feeling satisfied, not over-stuffed. Plus, they are just really nice there. My only complaints are the noise level due to the cavernous ceilings and all that concrete and the akward indoor waiting area that makes it almost impossible not to hit other waiting patrons with the door on the way in and out. How about a whole Alberta breakfast round-up with Tin Shed and Vita? Because, and despite the hoards of people waiting for tables and spilling out over the side walks and into the street, I just don’t get the appeal of those two places. Thanks, glad you liked it. You make a good point about the waiting area, and I’ll have to include that. It’s one of those things where if it’s raining or chilly outside, the people waiting have no choice but to stare at the people eating. And I haven’t been on a weekend (I tend to go hiking instead), so I don’t know about the noise, but I can see where the design of the place wouldn’t exactly muffle sound. I happen to love Tin Shed, but I can see where the insane wait is a turnoff. As for Vita, I’m still trying to make up my mind on that one. I plan to write it up soon, so at some point I have to make a decision! 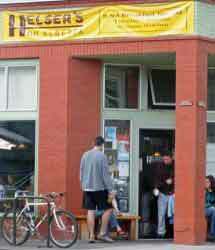 I loved Helser’s so much more back in early 2005 when no one knew about it yet and there was hardly ever a wait. :) I blame myself for telling too many people how good it is. Paul, I was going to suggest the same thing; coffee is important to a lot of us. It would also be good if that Food Dude guy would remember to put in a google map link. Geeze. Yes, I meant to get that info on the coffee, only to realize I had failed to when I sat down to write. I just didn’t feel like calling them to ask what kind of coffee they serve. I do know it’s good, though. Does that help? Actually, I’ll find it out and post it here as a comment. I’m with you on Elmer’s. I actually go to the one on 82nd before meeting hiking groups at Gateway Park and Ride. The other place with terrible coffee (but otherwise great food, I think) is the Original Pancake House. I swear it’s a matter of pride with them to not serve good coffee. Helser’s is one of the things I miss the most about leaving the Alberta Arts area. Of course, I still mourn the passing of Chez What and their perfect hangover food, so it’s obvious I have problems with breakfast-food attachment. Being a relatively short distance from Roux, Beaterville, and Diprima Dolci (try the peasant breakfast if you’re in the area) at my new house gives me more options, but it’s still cold comfort. I live in Salem and don’t get to Portland much, but I’ve been to Helser’s twice and I love it. The first time we went we had lunch and it was–perfect. An egg salad and a tuna sandwich, just what you sometimes want for lunch but taken to new heights. I forgot to tell them to skip the potato chips my sandwich was served with and am I glad I did! They’re made right there and sliced on a mandoline attachment that gives them a tiny lattice pattern. They are worth every calorie. The second time we had breakfast.Personally, I didn’t think the pear-havarti egg pie worked, the tastes and textures were just too bland with not enough contrast, but I loved the more traditional breakfast my husband ordered. I thought the service was wonderful and felt really pampered and relaxed. I just purely LOVE the Louisiana hot sausage scramble! Nothing like it in Portland, anywhere else. It’s stuck in my food memory and it’s a real problem not to order it every time I go there. Count me among the “internet wackos,” then. I lived a block away from Helser’s for a year and considered it a last resort, breakfast-wise, in spite of the convenience. It shouldn’t be that difficult to find good breakfast potatoes in this town, but it is, and Helser’s doesn’t even rate; I mean, come on, they use POWDERED GARLIC in their taters!! That is an unforgivable offense. While the cheap early bird breakfast special appealed to my frugality, and the pancakes were solid fare, not once did I actually get eggs cooked over medium as I had ordered them. And the hollandaise? Fuhgeddaboutit. They have no business calling that soupy stuff hollandaise. Don’t get me wrong, the service is pretty good and friendly, the space is cute, and I think that the place inspires a pretty fierce neighborhood loyalty, but to praise it as one of Alberta’s best breakfast options is just way off the mark – I’ll take Tin Shed or Cup & Saucer before Helser’s any old time. Tin Shed over Helser’s? For real? I went once and my poached egg had a cooked yolk, but I’ve had god-knows how many poached eggs at Helser’s and they’ve always been nice and runny. I’m curious, though, not having much hollandaise experience besides the few that I’ve had out, and my own (from the Joy of Cooking), what should a good hollandaise be like? _sauce All about hollandaise. Don’t you just love the internet? Funny, I was going to say “Cup and Saucer over Helser’s — for real”? I love the range of opinion on these places. Same with potatoes and hollandaise, for that matter. I’ve been to Cup and Saucer a couple of times and honestly can’t figure out what to say about it. I don’t like it or dislike it; in fact, I can’t find anything to react to about it at all. What do you like about it, Becca? Genie’s probably has the best breakfast potatoes in town. But I really cannot stand their hollandaise. The rest of the breakfast food I have had there is good. I’ve heard lots of good things about Genies, including from one owner/cook who goes there on his days off. What are their potatoes like? To clarify, I meant the Cup & Saucer on Killingsworth, not the one on Hawthorne. I don’t know if the distinction matters. The best hollandaise I’ve come across ANYWHERE is at Mother’s. It is pillowy-light and amazing, and I always order a side of it to dip my potatoes in when I eat there. (That sound you hear is my arteries groaning – SHUT UP, GUYS.) For the record, their potatoes are pretty darn excellent, too. What do I like about Cup & Saucer? The space, the fact that they mix yams into their (sometimes burnt) potatoes, their lovely little vanilla scones, and their pesto tofu scramble. The service. The cocktails. And the fact that I sat there with a friend over a game of gibberish Scrabble for four hours one Sunday afternoon and was treated wonderfully the whole time. As for Tin Shed, their scrambles are always excellent, and their coffee is really good. The potato cakes are enh, but they’re unusual, and sometimes it’s fun to mix it up. And their biscuits are unlike any you’ll find elsewhere in town, in the good way. FWIW, I think the best hollandaise in town is at Simpatica. I usually enjoy it with a strata there, not a benedict. You can only get it on Sunday, though, as they are not open Sat. for brunch. Simpatica is my favorite brunch on town, nothing else seems to come close. Genie’s serves well-seasoned roasted red potatoes that come crispy when you order them that way. They really are great. I think they also offer another kind of potatoes too, but the roasted red ones are killer. Good scrambles too, but I’ve never had the french toast or pancakes there. Last time there I ordered ham instead of bacon and got a huge plateful o’meat. Tasty stuff, too. Both Genie’s and Simpatica pour Stumptown, btw. And they both will let you pour yourself cups of it while you wait for a table. Get there before/by 9am, and you won’t have to wait at either place, after, and you take your chances…At least at Simpatica your waiting will be indoors. And Genie’s has a full bar…whose offerings include an Emergen-C Elixir: orange vodka, muddled lemon, orange Emergen-C and a cranberry splash. :o) Not a big breakfast drinker, myself, but hey, some folks like a sousy breakfast…and more power to ’em! I’m intrigued! I will definitely have to give Simpatica’s brunch a try; I’ve been drooling over their mailing list missives for a few weeks now. I for one am quite game for a drinky breakfast every once in a while, and Genie’s is definitely the place to go to satisfy that yen – their mimosas are VERY generous! Well, then you should try Simpatica, Becca! Though they don’t have a full bar, they do make mimosas (with fresh OJ), and various vodka and juice drinks. I’ve watched them make the mimosas…3/4 of a wineglass full of sparkling wine and a splash of OJ. The only reason I eat there is the 3.95 breakie. The eggs are often overcooked, the pancakes are rather plain. (Beaterville’s cakes are the best and they are FAST!) Service is ok. I agree with the review: nothin’ special, nothin’ awful. I wanted to alert Becca to the best breakfast potatos in Portland – actually they are in Gresham – The Central Cafe – they absolutely rock. Whether or not they use garlic powder is anyone’s guess, but they are seasoned really well, and unlike most other places, they are not bland and boring. Oh yeah, and I really like Helser’s – good, interesting food, and attentive service. If ever they have the chicken + biscuits and gravy special – GET IT! The mushroom gravy (sounds odd for breakfast, I know) is AMAZING. The fried chicken is fantastic as well. Love this place! Very good service and very tasty food. They serve Kobos coffee. Helsers is honestly one of the reasons we moved to the neighborhood!